"YORKSHIRE, a maritime county of England; bounded N. by Durham and the Tees, NE. and E. by the North Sea, S. by the Humber and Lincolnshire, Notts, and Derbyshire, SW. by Cheshire, W. by Lancashire, and N.W. by Westmorland; length, E. and W., 96 miles; breadth, 80 miles; area, 3,882,851 acres, population 2,886,564. Yorkshire is the first county of England in point of size, and the third in point of population. From the mouth of the Tees to Flamborough Head the coast is bold and rocky; from Flamborough Head to Spurn Head it lies low. The interior presents the appearance of a great central valley stretching SE. to the Humber, and flanked on either side by heights - on the E. by the Cleveland Hills and the Wolds, and on the W. by the Pennine chain. . . Yorkshire takes high rank as an agricultural, manufacturing, and mining county. It is well supplied with every means of communication. It has from an early period been divided into 3 Ridings - viz., East, North, and West, besides the Ainsty or Liberty of the city of York. Each Riding has a lord-lieutenant and a separate court of quarter sessions and a commission of the peace, and statistically is treated as a distinct county. It contains 26 wapentakes; 3 liberties; 1636 pars. with parts of 2 others; the parliamentary and municipal boroughs of Bradford (3 members), Dewsbury (1 member), Halifax (2 members), Huddersfield (1 member), Kingston upon Hull (3 members), Leeds (5 members), Middlesbrough (1 member), Pontefract (1 member), Scarborough (1 member), Sheffield (5 members), Wakefield (1 member), and York (2 members); and the municipal boroughs of Barnsley, Batley, Beverley, Doncaster, Hedon, Morley, Richmond, Ripon, and Rotherham. It is in the dioceses of York, Ripon, and Manchester." the Yorkshire GENUKI site, please read the "Important Information" page. The page includes some tips, term definitions etc. etc. please see the England pages and the U.K. and Ireland pages or try the Genuki search engine. Dale, Wapentake, Parish, Deanery etc. please see the page of definitions of terms. Elsewhere in England for most of the counties you will find a County Record Office, sometimes with "sub-offices". In Yorkshire however the situation is anything but simple, not helped by the change in 1974. Prior to 1974 there were simply the 3 Ridings and York (and these Genuki Yorkshire pages are laid out in that system). After 1974 the overall administrative boundaries of Yorkshire changed, as did the internal boundaries and Yorkshire became North Yorkshire, West Yorkshire, South Yorkshire, North Humberside, and part of Cleveland with bits of Yorkshire being "given" to County Durham and Lancashire. Since 1974, things have changed yet again but not so drastically. If you are unfortunate enough to be looking for records in the parts that have changed you may have difficulty! There are county record offices for North Yorkshire (not the same as the old North Riding) and the modern East Riding (was North Humberside and not the same as the old East Riding). West Yorkshire (not the same as the West Riding) has all of its records united. Both Kingston upon Hull and York (which is now in North Yorkshire) have City Archives. For South Yorkshire (the southern part of the old West Riding) has its archive services provided by the four district councils independently. The East Riding of Yorkshire Archives Service exists to collect, preserve and make available to the public the historic records of the East Riding. The Archives Service holds over 10,000 linear feet of documents dating from the 12th century to the present day. These records contain information about every community in the East Riding and cover a wide range of subjects. The North Yorkshire County Record Office collects, preserves, and makes available a wealth of archive material relating to the history of the county of North Yorkshire. They hold millions of documents all shapes, sizes and ages which can be used to obtain information for many personal, legal, administrative and historical purposes including tracing ancestors and family history and genealogy. They maintain an online catalogue of descriptions of most of their documents. The West Yorkshire Archive Service (West Yorkshire County Record Office) exists to preserve the county's heritage of historical documents and to help members of the public make use of them. They have an on-line catalogue covering all five of their offices. The York City Archives are open 9.00 am till 5.00pm Monday to Friday closed for lunch 1.00pm till 2.00pm. They hold the corporation records covering approximately 800 years, and there are no charges for researchers visiting the archives, and no appointment is necessary. Hull City Archives hold a wealth of information, covering the rich and varied fortunes of the city. The collections include non-conformist churches, local families, municipal cemeteries and records of the courts. In addition they hold unique photographs many of which are now accessible online via their historical photographs database. The Borthwick Institute of Historical Research is at the University of York. The Yorkshire Archaeological Society exists to promote the study of Yorkshire's historical past - agriculture, archaeology, architecture, history, industry, religion and the people of the historic county. The Royal Commission on Historical Manuscripts (now National Archives) has a most useful Web-site which has searchable databases containing information on where collections of archives can be found. The search can be by people, places or Companies.It also has on-line a Manorial Documents Register for England which, although not complete, does cover the whole of Yorkshire. The Yorkshire Film Archive Online has lots of old films on-line, such as the Climmers at Bempton, Queen Victoria in Sheffield, Country Potters, etc. etc. A list of books relating to Yorkshire has been produced by the members of the Yorksgen mailing list. A transcription of the book " Yorkshire Folk talk" dealing with the Eastern half of Yorkshire, written by the Rev. M. Morris in 1892. Transcribed by Colin Hinson. A transcription of the book " The British Workman" dealing with a farm worker from the Wolds area, again written by the Rev. M. Morris. Transcribed by Graham Metcalf. A " Guide to Richmond", produced in 1833 by W.R. Robinson, and describing Richmond and the surrounding area with various histories, but very few ordinary people mentioned. Transcribed by Colin Hinson. An unpublished book " Scarborough's war years, 1939-1945" by Richard James Percy. This book describes the blackout, evacuees, fortifications, bombing, etc. Whilst it deals with the Scarborough area, it will be of interest to others as an example of what went on during the war years. Associated with this, you might also like to read the documents on " Evacuation from Newcastle and Gateshead in 1939". See also under Church Records and History. The Dalesman publishing company not only publishes books and magazines about the Yorkshire Dales, but also about the rest of Yorkshire too. They also have a "Family Quest" section on their web-site. Baines's History, Directory and Gazetteer of the County of York, 1822 and 1823. These two volumes cover the whole of the county between them, giving descriptions and/or history of all the places, and a list of people in Trades and Professions for the larger places. Bulmer's History and Directory for East and North Yorkshire 1892 and 1890, giving descriptions and/or history of all the places, and a list of people in Trades and Professions for the larger places. Dr. Whitaker's History of Craven gives a history of each parish in the Deanery of Craven, complete with pedigrees for the major families. The book was originally published in 1812, and the final updated version in 1878. During our visits to Yorkshire, I have taken over 50,000 photographs of graves in the East Riding. You can access the Graves Surname index here. In her travels round the county, Mel Towler has built up a large number of "Stray" inscriptions. These have been posted to Yorksgen and other lists one at a time and can be seen here, listed complete up to December 2001. A list of the 1851 and 1881 Census Yorkshire "strays" (people born in Yorkshire, but not in Yorkshire at the time of the census) including Wales and the counties of Derbyshire, Devon, Lancashire, Lincolnshire, Middlesex, Norfolk, Northumberland, Surrey and Warwickshire transcribed by Carol Clyde. Alan Longbottom has also transcribed a list of the places in each registration district for the North and East Ridings. The data gives the place, the area, the district and the district number. Find a Church is the UK church directory for Christian Churches of all denominations. In our travels around Yorkshire taking photographs, my wife Pauline and I often come across buildings which appear to have been Churches or Chapels. Some of these buildings we cannot identify - can you help? Colin Blanshard Withers kindly donated the contents of his book " Yorkshire Parish Registers" which gives the dates of and the whereabouts of church registers is to be found on each of the Genuki Yorkshire parish pages under "Church Records". The Yorkshire Archaeological Society holds copies of a lot of the parish registers in printed form as books, micro-fiche and CD rom. Please see their Yorkshire Parish Register web-site for more information. The Society of Genealogists hold a considerable number of copies of Parish Registers for Yorkshire and the rest of the counties in the UK. Paver's marriage licenses is a series of extracts from Marriage Licenses, formerly preserved in the Registry of York, is taken from a MS. of Mr. W. Paver. Transcribed by Colin Hinson. The Northowram Register is a register of nonconformists produced by the Revs Oliver Heywood and T.Dickenson between 1644 and 1752. Transcribed by Colin & Pauline Hinson. Paul Joiner's Marriage Index for Durham and the North Riding of Yorkshire. The Quaker FHS have a page dealing with Quaker Records in various parts of the UK. The Yorkshire Quaker Heritage Project have on line databases which enable the user to trace references to specific individuals and families within Monthly Meeting minute books, eventually for the years 1652 to 1948. These do not cover the whole of Yorkshire. For the available records for Brighouse; Knaresborough; Leeds; and Settle, see the Leeds University Quaker records site, and for the records that are available for the rest of Yorkshire (the East Riding and part of the North Riding, centred on Malton, Scarborough, Whitby, Pickering, Bridlington, Owstwick, Cave, and Hull) see the Hull University site, following the "Online databases" link. Sheila Wilson Smith has transcribed the Yorkshire "Strays" from the published indexes of The Combined Methodist Baptisms for the Isle of Axholme in the Counties of Lincolnshire and the West Riding of Yorkshire. In general, in order to find a Birth, Death or Marriage registration (or Certificate), you need to deal with the appropriate Registration Office. To find the Registration Office where this information is now (they changed over the years), you need to go to the appropriate Riding list of Registration districts (In "1" below) to find which Office currently holds the data, and then go to "2" below to find the address of that Office. If you do not know which Riding the place you are looking for is in, then use the "Where is it in Yorkshire" files to find out. You should also look under Towns and Parishes for more information on places in Yorkshire. West Riding, and those places within them maintained by Brett Langston. To compliment this list, there's also an alphabetical index of place-names, showing the counties and districts in which they were situated for the period 1837-1930. There is a list of Register Office addresses for England and Wales, maintained by Peter Abbott. This includes some instructions for obtaining Certificates. The Yorkshire BMD is an on-going project to put on-line the indexes to births, marriages and deaths, based on the original civil registrations from 1837 to 1950, held at the local register offices of Yorkshire. The Register Offices of the former county of Cleveland (Middlesbrough, Stockton-on-Tees, Redcar & Cleveland, and Hartlepool) have the indexes of their Registers online. There are two excellent descriptions transcribed from Bulmer's History and gazetteers, one for the East Riding (1892) and one for the North Riding (1890). A short description of the county transcribed by Steve Garton from Pigot's 1834 Gazetteer and Directory. The Yorkshire Information Centre contains descriptions of various parts of Yorkshire, particularly the northern half. Garry Stockdill has an excellent web site which he calls " Yorksview". This contains many photographs and description of places mainly (but not all) in the western half of Yorkshire. Garry has also contributed many of the church photographs from the West Riding which appear on this site. The freefoto.com website provides photographs for free download. Most of these are linked to from the appropriate parish pages, but some areas cover more than one parish. These are: Swaledale(4 pages), Wensleydale, Wharfedale and The Humber Bridge. Devoted to walking in Yorkshire, the Dales Walks web site gives details (including photos) of walks around the various Yorkshire Dales and " The Three Peaks walk" website gives information and photographs of the walk over the peaks of Ingleborough, Whernside and Penyghent. The North York Moors and the Yorkshire coast. Tourist guide and where to stay in the North Yorkshire Moors area (the North East of Yorkshire). England's North East is a site dedicated to history, identity and places to visit in Yorkshire and the North East. A Topographical Dictionary of Yorkshire (a list of place names, with descriptions) in 1822, by Thomas Langdale. Where is it in Yorkshire? - A hyperlinked index to information on nearly all the places in Yorkshire: cities, towns, villages, most of the hamlets and some single houses. The list also includes links to information on some places which no longer exist. There are pages containing the definitions of territorial terms such as Riding, Wapentake, parish etc. The Yorkshire Surnames list and is maintained by Lin Duke. Please try to make it easy for Lin by obeying the rules when submitting your names! For other surnames interest lists, please see the Genuki list of surnames lists. As you can see from the list below, there are many genealogical mailing lists for Yorkshire. The most active list is YORKSGEN which covers the whole of Yorkshire. Most of the rest of the lists deal with specific towns or small areas. Please keep in mind that someone subscribed to Yorksgen but has an interest in (for instance) Leeds, may not be a subscriber to the Leeds list. The YORKSGEN Mailing List is an unmoderated list administrated by Lin Duke, dedicated to the genealogy, and history of the whole of the County of Yorkshire. The scope of this list covers the pre-1974 county boundaries. The WEST-RIDING Mailing List is an unmoderated list administrated by Lin Duke, dedicated to the genealogy and history of the (old) West Riding of Yorkshire. The scope of this list covers the pre-1974 county boundaries which is the area relevant to genealogy. The SHEFFIELD Mailing List is an unmoderated list dedicated to the genealogy and history of the Sheffield and Rotherham areas. The scope of this list covers the same areas as those covered by the Sheffield FHS and the Rotherham FHS. 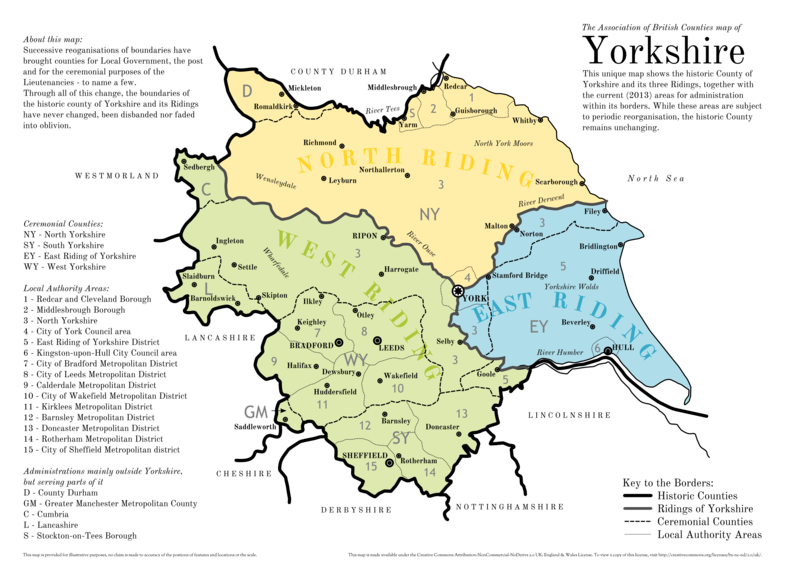 The EAST-YORKS Mailing List is an unmoderated list dedicated to the genealogy, and history of the (old) East Riding of Yorkshire. The scope of this list covers the pre-1974 county boundaries which is the area relevant to genealogy. The ENG-YORKSHIRE Mailing List is an unmoderated list administrated by Lin Duke, and is dedicated to the genealogy, as well as the rich history of the people and places from the whole of the County of Yorkshire. The scope of this list covers the pre-1974 county boundaries. The ENG-TODMORDEN Mailing List is an unmoderated list, dedicated to the genealogy and history of Todmorden which borders both Lancashire and Yorkshire. The BRADFORD Mailing list is an unmoderated mailing list administered by Jan Perkins. We focus on the area that is covered by the present day Bradford Postal Codes. BD 1-23. Skipton to the North, Tong to the east, Cleckheaton to the south and Keighley area to the west. The HARROGATE mailing list is an unmoderated list for anyone with a genealogical interest in the present day Borough of Harrogate, Yorkshire, England, which includes the towns of Harrogate, Knaresborough, Pateley Bridge, Nidderdale, Ripon, Masham and Boroughbridge. The YORK mailing list is an unmoderated list administered by Lin Duke, for anyone with a genealogical interest in The Ainsty & City Of York, Yorkshire, England. There are also some other mailing lists that cover areas covered by the above, such as the border areas of Yorkshire/Lancashire ( ENG-LANCS-YORKS). The UPPER DALES GROUP mailing list is one of the Yahoo mailing lists and covers Swaledale and Wensleydale, the most northerly of the Yorkshire dales and is administered by Peter Underwood and Ann Wilson. A list of all the mailing lists covering the counties of England and English subjects (under "General") can be found in John Fuller's list of Mailing Lists. Halifax, Dewsbury, Doncaster, Leeds and Hull. To browse or search these, go to the list of indexes and enter the relevant place name in the "Find a list" search box. For those new to Genealogy and Family History, Roy Stockdill has written a " Newbies Guide". While this is written for the West Riding of Yorkshire, most of the information will be of interest to a far wider audience. This file should be read in conjunction with the Genuki " Getting started" pages. There are some additional Genealogical links (and some non-genealogical links such as recipes) for Yorkshire on the Blunham home page. The YORKSGEN lectures and presentations took place in 2000, 2002, 2004, and 2006 with occasional meets for a meal. These presentations were primarily for subscribers to YORKSGEN, but anyone interested in Yorkshire genealogy was welcome to attend. There are programmes of talks and visits, and opportunities to listen to experts on Yorkshire genealogy. The 2000 event was organised by Conrad Plowman and Anne Harley to whom lots of thanks must go. Resulting from these events are quite a few photographs (along with some sound files). Genweb has a section for Yorkshire. A History of Yorkshire transcribed from Bulmer's 1892 History and Directory of East Yorkshire. www.yorkshire-england.co.uk is a site dedicated to history, identity and places to visit in Yorkshire and the North East. Pat Johnson is providing a FREE lookup service of the names contained in her large collection of original Family Deeds. Most of them relate to property and financial transactions and may provide details which aren't available in the more usual sources of parish registers and Wills. Transcriptions of the full documents are available for a modest fee, and the original deeds may also be available for purchase if required. A list of Yorkshire places which are mentioned is provided onsite. Deanna Fowler has kindly made available scans and transcriptions of 4 different land deeds from the 11th, 12th, and 13th centuries, 3 from Yorkshire and the other of unknown origin. The scans can be downloaded in two different sizes and the translations are given. Originally posted to the Yorksgen mailing list, here are alphabetic lists of the Owners of Land in the North Riding of Yorkshire in 1871. The late David Simpson transcribed an indenture for the use of a Windmill at Pudsey. This is an Adobe Acrobat (pdf) file. A glossary of unusual words to be found within the Genuki Yorkshire pages. A transcription of the book " Yorkshire Folk talk" dealing with the Eastern half of Yorkshire, written by the Rev. M. Morris in 1892. A transcription of a book of "Lyrics", some in dialect. Here is a web site dedicated to the Yorkshire dialects, complete with audio. The Yorkshire Dialect Society was founded in 1897. Specimens of the Yorkshire Dialect transcribed by Graham Metcalf. There are instructions for downloading a detailed electronic map of Yorkshire which shows all the cities, towns and villages, most of the hamlets and some single houses. If printed out at 1:1 scale, this map is appoximately 5 feet square (it is however quite readable at 50% scale). There is a set of three maps showing the parishes for each of the Ridings (the Ainsty is shown with the East Riding). Here is another (smaller) map showing the wapentakes within the 3 Ridings, The Ainsty, and Hull. Tana Willis Johnson has produced a map showing the old Ridings of Yorkshire superimposed on a post 1974 map. The Old Maps website has available various old maps dating from the mid 1800s onwards. It is free to view small sections of these. The Association of British Counties have produced a map of Yorkshire : this unique map shows the historic County of Yorkshire and its three Ridings together with the current (2013) areas for administration within its borders. Roll of Honour of civilians killed by enemy action in the UK during World War II - listing of nearly 4000 entries relating to Northumberland, Durham and Yorkshire. The Yorkshire Regiment, - First World War Remembrance of members of the Regiment. Anji Mungham has provided a LIST OF OFFICERS who have held commissions in the North York Militia and the 4th Battalion (Alexandra, Princess of Wales' Own) Yorkshire Regiment, from 1758 to 1907. Here are the STANDING ORDERS for the 65th Regiment (of Foot). [Formed in 1758, later to become the Yorks Lancs]. transcribed by Walt Norris. and a document detailing the recruits for his Majesties 65th Foot commanded by Lieut. Genl. Edward Urmston. These men were probably recruited to fight in the Amercan war of Independence, again transcribed by Walt Norris. The Battle of Britain Historical Society maintains pages giving information on some of the pilots who were killed in during World War II. Sir John Reresby's Militia Troop of 1623 raised from the Strafforth and Tickhill wapentake. The West Riding Muster Rolls for 1680, Part 1 and Part 2, transcribed by Denise Oyston. "A key to English place names" provides an up-to-date guide to the interpretation of the names of England's cities, towns and villages. This site uses the same pre 1974 county boundaries as this GENUKI site. "This is York" is the web-site for the Evening Press/Gazette & Herald, York/Selby Star & York Advertiser. Andrew Sefton has transcribed the Births, Marriages and Deaths from the Malton Messenger for the years 1854 to 1867. Please see the Genuki Malton page for these. Jeff Knaggs built the Indexes to Death Notices in Yorkshire Newspapers. A list of the seats of the Nobility, Gentry and clergy for the year 1840 has been transcribed by Marilyn Smith and Maureen Reynolds. The following lists of mines are provided by the Peak District Mines Historical Society Ltd.
A list of some of the Boot and Shoe makers of Yorkshire collected by Carole Clyde, and a further list covering the years 1851, 1853 and 1881 for the West Riding only. A list of the Yorkshire Bankers of 1845. Caroline Gaden has transcribed the entries for Public Officers of the North Riding and of the East Riding from Whites Directory and Gazetteer of 1840. There is also a Workhouse and Hospitals mailing list (hosted by Rootsweb). Colin Blanshard Withers has produced a list of all known Indexes and Calendars relating to Yorkshire Probate. This is available in both MS Word format (.doc) and plain text format (.txt). The Find My Past network has indexes to a large number of Yorkshire wills in their National Wills Index. Please note that this site requires a subscription to do searches. The Northern Police Orphanage at St George's House, Otley Road, Harrogate looked after children of police families, mostly from North-East England. It was founded by Catherine Gurney in 1898 and closed in 1956. Yorkshire Ridings Society was founded in 1974, to protect the Yorkshire identity threatened by local government changes made then and since. London Group of Yorkshire Family History Societies. An extract from a book by Edward Parsons (1834) examines the effect of industrial working conditions on public health in the industrial area of the West Riding. Links to transcriptions of the Subsidy Rolls (Poll Tax) for 1379 for the West Riding, the Ainsty, and the Howdenshire wapentake are to be found on the relevant parish pages. A transcription of the Subsidy Rolls for the Ainsty wapentake from the 16th century. There is also an introduction to the 1379 Subsidy rolls. The Ainsty and City of York. Where is it in Yorkshire? - A hyperlinked index to information on nearly all the places in Yorkshire: cities, towns, villages, most of the hamlets and some single houses are included. The list also includes links to information on some places which no longer exist. There is also a large and detailed electronic map of the County. Please see also Maps above. This county is maintained by Colin Hinson, with help and information provided by a great number of people who are credited on the relevant pages.